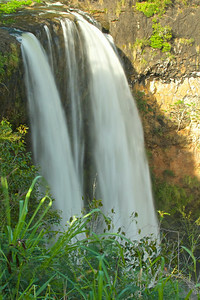 Wailua Falls is a spectacular 80 ft. high waterfall. In normal flows, it is really quite pretty, dropping in 3 separate segments. 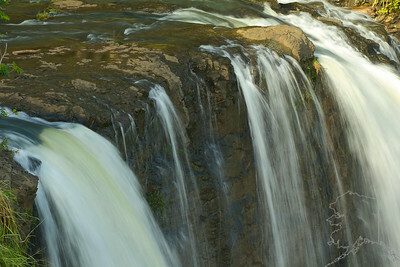 In high flows, as shown above, it is a single massive falls. Wailua Falls is the waterfall that used to be shown on the old TV show, Fantasy Island. It is also where in ancient times men used to dive off (over the falls) to prove their worthiness. Let me tell you, I would not be diving off this cliff. But it definitely is a spectacular waterfall. The best time to visit Wailua Falls is very early in the morning before all the crowds come in. After a big rain storm!! 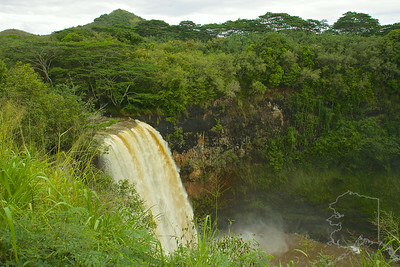 Wailua Falls is a spectacular 80 ft. high waterfall. In normal flows, it is really quite pretty, dropping in 3 separate segments. 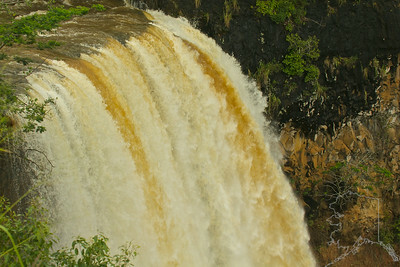 In high flows, as shown above, it is a single massive falls. Wailua Falls is the waterfall that used to be shown on the old TV show, Fantasy Island. It is also where in ancient times men used to dive off (over the falls) to prove their worthiness. Let me tell you, I would not be diving off this cliff. But it definitely is a spectacular waterfall. The best time to visit Wailua Falls is very early in the morning before all the crowds come in.